These statistics are very troubling because it is proven that the younger a person is when they begin consuming alcohol, the more likely they are to become addicted to alcohol. Another reason this figure is frightening is because alcohol is the gateway drug, leading to other drugs. And what else can you do as an adult to prevent underage drinking? 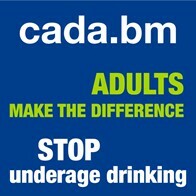 Do not give, buy or serve alcohol to young people. Giving alcohol to someone who is under the age of 18 or turning a blind eye when a young person is consuming alcohol is dangerous and irresponsible. Step in and put a stop to it. It is proven that those who begin consuming alcohol before the age of 15 are 4 times more likely to become addicted to alcohol than those who wait unitl age 21. Some adults use alcohol as a "special occasion celebration," perhaps allowing their child to have a sip of beer or champagne or wine. We must advise strongly against this. Simply stated, children copy adults behavior, therefore model restraint and set a good example. If you choose to drink, you can positively influence young people by drinking in moderation and never driving if you have been drinking. If you or your partner struggle with alcohol use, seek proffessional help, call 295 5982. Don't keep alcohol in your house, or keep it well out of reach. If you must keep alcohol in your house, keep it in a place that is high up and out of easy reach to your child, or even better lock your alcohol up.